There's the right way ... the wrong way ... and the Haugen way. I think Huckleberry has OCD. Our basset hound pup is about seven months old. Due to his slow potty-training progress, his eating habits that consist of beans and tomatoes off the vines in my garden and plums off my trees, and his relative slowness in everything he does, we've suspected that he might be a little mentally challenged. Granted, his housemate and mentor, Stanley, a Golden/lab cross, is a member of MENSA for Dogs, so it's not a fair comparison. Still, I've heard that bassets have two brain cells and only use one of them, and Huck is doing nothing to smash that stereotype. But lately Huck has been showing some progress. He's learned to scratch at the door to go outside or even woof. And he really surprised me the other night. My normal routine in the late evening is to let the dogs outside to do their business, then we go into the spare room where I have my desk, books and an extra single bed. The dogs usually hop up on the bed and snooze while I write. Then after a half hour or hour, I tell them it's bed time, they hop down and we go into my bedroom where they sleep on the floor. Except for the other night. I was extra tired and decided to skip the writing part so we went straight from outside bathroom duty to the bedroom. A minute later, Huck started scratching on the door. I told him he'd just gone outside. He didn't answer, kept scratching. So I opened the bedroom door. Instead of taking a right to the outside door, he took a left into the spare room, hopped up on the bed and looked at me. I told my wife, "Guess I'm going to write for a few minutes." 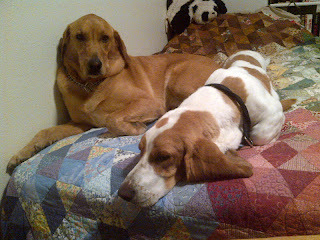 Stanley joined Huck on the bed where they immediately fell asleep. I proofread some stuff for 10 minutes, announced it was time for bed and they hopped down and went into the bedroom for the night. All was well. I guess you don't mess with Huckleberry's routine. And, if nothing else, he keeps me on task in the writing business. Zoo Falls is available exclusively in ebook form at Amazon for 90 days. If you are a Prime member, you can get the book for free. Otherwise it is only $2.99. If you are an iPad owner, you can get the free Kindle app and download it there as well. 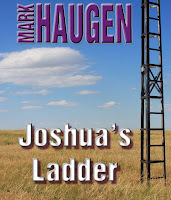 Here it is available in ebook form, Joshua's Ladder. And now available in paperback! I hope you like it and I appreciate you checking it out. 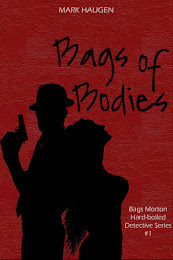 If you aren't already a member of Smashwords, it's simple to sign in. A fifth-generation South Dakotan, Haugen is a recovering journalist living in the Black Hills with his wife, one or two teenagers, two dogs and Ragnar, the pet rabbit. Haugen is a former newspaper reporter, editor, sportswriter, publisher and award-winning columnist. At various times he has lived in Montrose, Canton, Sioux Falls and Valley Springs. He's worked at the Sioux Falls Argus Leader, Tri-State Neighbor and owned the Tea & Harisburg Champion newspaper in Tea. He also had brief forays across state lines and worked at newspapers in Windom and Luverne, Minn., and Rock Valley, Iowa. Haugen is also an avid runner and gardener.